One of the things I love most about Target, is it is a ONE STOP shop! I truly can walk in there, and find everything I need for my little family! Including clothes for my littles, and in this particular visit, shoes for my twinners! The twins are just starting to stand, and take their first steps! How can it be? I knew that meant that I was going to need some new shoes to help them along on this new journey they are about to have! 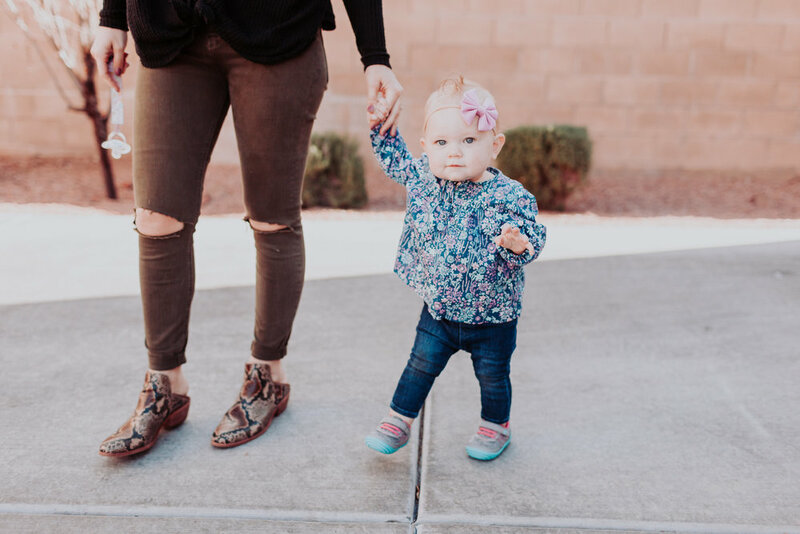 When I was looking for shoes for my newly balancing babes, I wanted them to be comfortable, stylish, and of course durable so they can last through this crazy phase of ups and downs. I found the perfect pair at Target in the infant section. They are the Surprize by Stride Rite, not only did they have so many different cute styles to pick from, but they also had some really amazing promises they live by. On the box, they promise comfort and flexibility for healthy foot development, this is so important while they are learning to walk, if you have ever seen a new walker, they are all sorts of wobbly! I can attest that this is true, my girls always try to rip their shoes off the minute I get them on! However with these ones they kept them on for an entire outing, #goals! The shoes are also promised to be durable, and be able to keep up with this busy toddling phase that they are in. My girls are literally falling over ALL the time, I somehow wonder how I have not had more scrapped knees, anything to her with spills is a win in my book! My favorite perk of the Surprize by Stride Rite is the Anti-Stink lining that they put in the shoes to help prevent odors. We live in Las Vegas so things are bound to get sweaty, none the less, that is a huge positive for me! The most convenient thing of all about the Surprize by Stride Rite shoes though, like I mentioned before is that they are at Target! Don't most moms seem to end up there somehow, and if we are not there, don't worry you can order them on www.target.com! If you are in need of shoes for your kids, these hit all the important points you want to check off! Go check them out at Target the next time you are strolling through for anything and everything!